Communal, utopian visions engaged a lot of people in the 1970s. Spirit-centered ways of living offered hope as the burned-out hulk of the idealistic 1960s smoldered with the anger and violence of Nixonian dread and inner-city ruin. 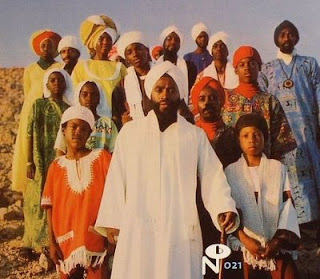 On the south side of Chicago and in tense Detroit, the Black Hebrew movement grew, bringing (along with an idealistic social vision and a passion for community organization) a strong, assured, and uplifting new musical synthesis that combined soul roots with psychedelic funk, gospel fervor, and an Old Testament message. After a harrowing exodus to West Africa, where many of the movement’s musicians were caught up in the life-threatening ironies of racial hatred and misunderstood cultural identity, the music at last found a place to thrive in Israel – in the desert city of Dimona, already heavily populated with North African Jews.